Ensure the reliability and safety of your hose nozzle before the start of the heating season. Understanding nozzle maintenance and care is very important to your fueling operations. Everyone involved should understand when a nozzle is at risk for needing replacement parts or being replaced entirely to ensure the safety of your operations. Look for any wear on the body of the fuel nozzle or Scully Swivel. External and internal damage can occur from dragging the nozzle on the ground. The nozzle should always be carried back to the truck. Rotate the swivel to see if it feels rough or gritty. If there seems to be any resistance, there could be an internal problem that should be dealt immediately, before continued use. Note that it may not show up as a problem immediately, but can quickly and easily progress to one. 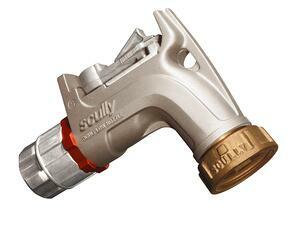 Check for signs of leakage on the Scully Swivel, fuel nozzle body, or under the latch plate. If there are any leaks, the bushing and O-ring should be replaced. It can be rebuilt—we have all the parts. Perform a status check of the fuel nozzle outlet O-ring. Use only Scully parts. You’ll know it’s a Scully O-ring, as ours are blue and made of fluorosilicone, which is used specifically for improved fuel resistance over silicone rubber. This O-ring can be easily replaced anywhere, even in the field. Scully sells our O-rings in bags of three through our distributors. The inside curve of the fuel nozzle body is another area to check for damage. Many customers use a holster assembly that sits against this bend that over time can wear down and cut into the body. This can weaken the nozzle and make it susceptible leaks. If you have any issues with the handle or latch plate—either not working correctly, not at all, or something has broken off, all can be easily removed and replaced. In general, if you see excessive wear on the Swivel components or nozzle, they should be replaced. Our customer service department can either send you our Complete System Catalog electronically, or you can request a hard copy, which lists all our products for delivery trucks. This is a very good reference for maintaining your equipment. We have created the video below to help you to understand the signs to look for and the options you have for easy maintenance. If you have any unanswered question give us a call at 800-272-8559 or email us at Sales@scully.com.